Surfers from around Europe are gathering in the North West of Ireland this month to tackle the problem of single use plastics that are getting dumped in our oceans. The contentious topics of beach pollution and marine waste are among the issues that will be covered in a busy weekend of talks, films and presentations that celebrate surfing, marine photography and the art and music that go along with the surf lifestyle. 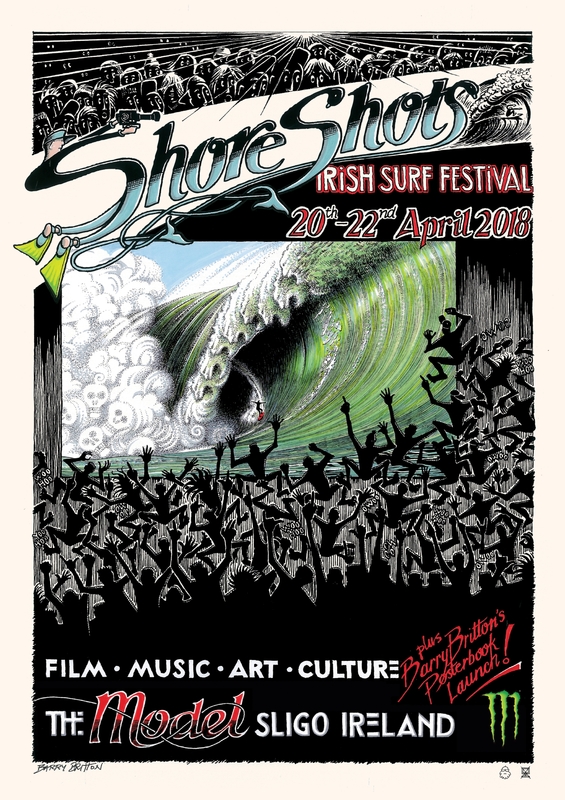 Taking place from April 20-22 at The Model in Sligo, this is the sixth year of the Shore Shots Irish Surf Festival with guests and speakers arriving from all the world’s surf capitals to take part. Award winning photographer George Karbus will deliver a talk on his time swimming with Orcas in the Arctic while South African waterman Ian Mitchinson will be talking about his time documenting the Irish surf scene and the big wave pioneers of our own west coast. Sunday April 22 is also Earth Day at the festival, part of a global initiative to raise awareness of environmental and green issues that are affecting surfers and communities around the planet. To mark it, there will be a special screening of the award-winning movie A Plastic Ocean, along with a talk chaired by Irish Climate Ambassador Niamh Smyth and a panel of activists and environmentalists. Surfer and activist Easkey Britton will be hosting a story-telling workshop on the Saturday while top film-makers while be introducing their films across the weekend as well as showcasing their latest works in surf and photography. Saturday at the festival is a fun-filled day out of movies, talks and short films celebrating the Irish surf lifestyle that will also be previewed on the Wild Atlantic Way Instagram account over the coming weeks. Also included in the festival are live music, a pub trail around Sligo and a book launch for pioneering Donegal-based artist Barry Britton who is celebrating 30 years of his artwork with a limited-edition new book and art showcase especially for the festival. Festival organiser Allan Mulrooney said: “It’s now one of the biggest gatherings of the surf community in Europe and a great chance for everyone involved in the sport to showcase what they’ve been up to over the past 12 months. Our team spend five months curating the best content from around teh world and fuse this with home grown work from the Wild Atlantic Way. It’s an important event for the surfing community and it’s great to have it here in Sligo so we can showcase the fantastic lifestyle, work life balance and world class waves on our doorstep." You’ll also be able to find out about new additions to the weekend line-up, where to stay and what restaurants and pubs to check out while you’re there. Capacity is strictly limited so do make sure to buy tickets in advance.